The presentations I've given over the last seven years have been a gentle introduction into the battle between companies. Unfortunately as an industry we're not only overwhelmed with glib phrases such as "culture eats strategy for breakfast / lunch" but also a paucity of data behind many of these statements. Alas, competition isn't simple. Well more specifically, simple forces create a complex world and we inhabit that world. 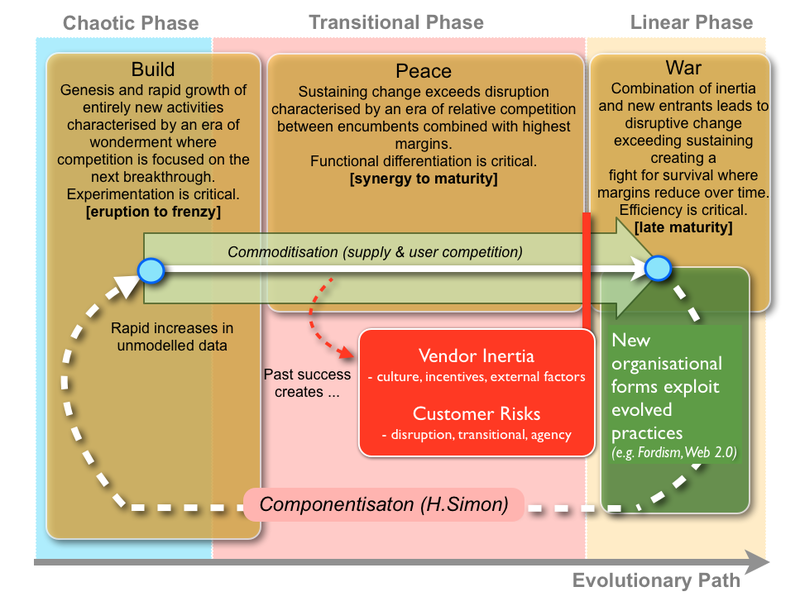 To demonstrate this and in honour of the general detritus that is "the ten habits of successful organisations", I thought I'd bring you Ten graphs on organisation warfare and why competition isn't simple. It should be noted that whilst graph 1 has enough data that I'm happy to call it a weak hypothesis, this diminishes the further we go down the list. Take everything with a big pinch of salt. First, I hope you're familiar with Everett Rogers work on the diffusion of innovation which was subsequently made popular by Geoffrey Moore in his book crossing the chasm. There are two things I'd like to highlight with Roger's work other than its startling brilliance. First, it's time based and therefore despite popular notions, diffusion curves are not identical and in some cases there is significant initial lag. Secondly, it's all about diffusion and hence whilst it will tell us how a particular product spreads it won't tell us about how an activity will evolve. For example, electricity has evolved from the parthian battery to modern day utility provision - diffusion doesn't tell us about that process but it will tell you about how utility electricity provision has been adopted. Unfortunately, we operate in a constantly evolving world so getting a handle on evolution is a pre-requisite for any form of strategy. 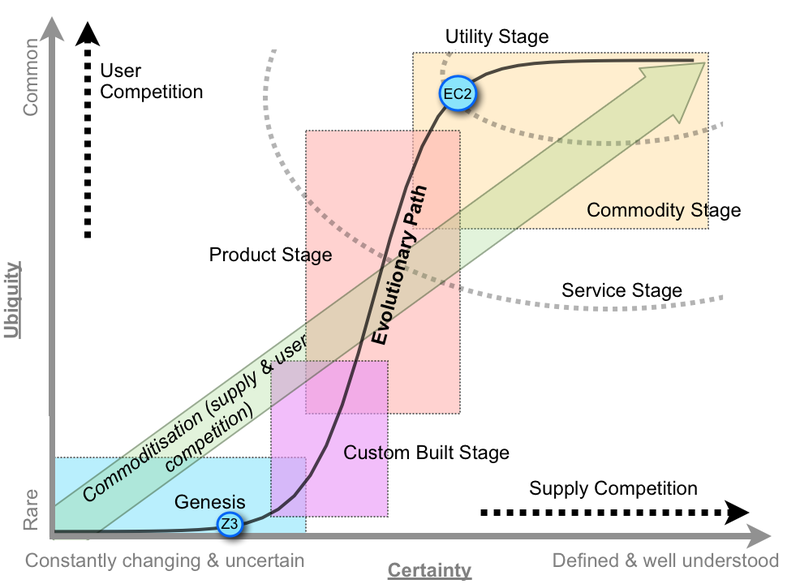 The graph above provides a standard pathway for the evolution of any business activity based upon user and supply competition. It's not a time based sequence, the axis being ubiquity (how common something is) and certainty (how well understood and defined something is). For reference, I've approximately marked onto the graph the positions of one activity - computing infrastructure - from the innovation of the Z3 to utility provision of EC2. For general reference, commoditisation is the commonly used term for this process of evolution. Major changes in our society are rarely due to the introduction of some new activity. It almost always occurs because some previous existing activity become ubiquitous and well defined - whether it's nuts and bolts (Maudslay's screw cutting lathe), electricity (Westinghouse and Edison) or computing infrastructure (Amazon EC2). The reason for this, is that the commoditised activity becomes a component of higher order systems e.g. nuts and bolts for machines, electricity for fridges etc. Herbert Simons showed that the provision of standard components rapidly accelerated agility and creation of new higher order systems. 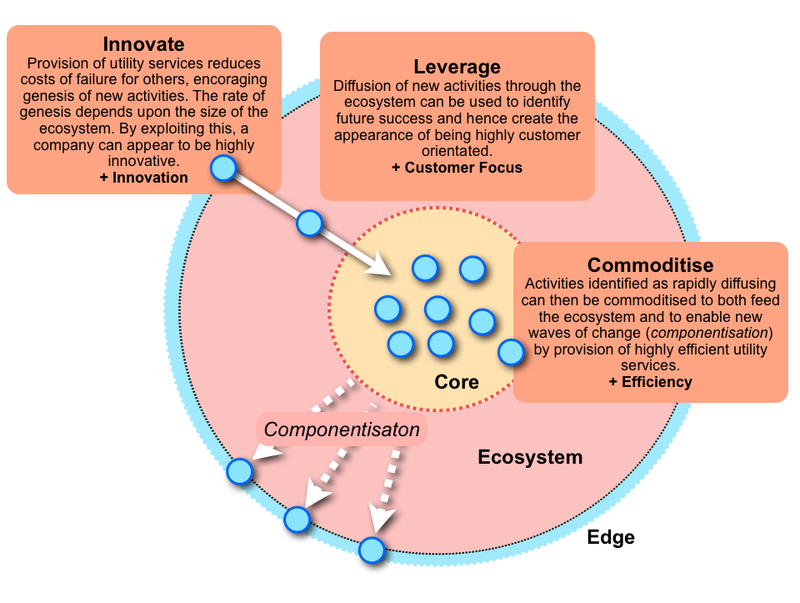 Hence, we have commoditisation enabling growth and agility of higher order systems. 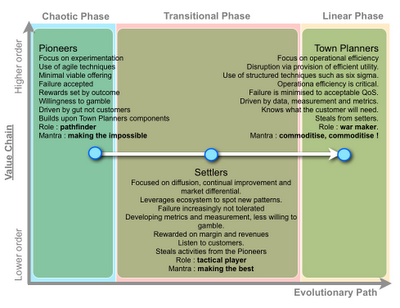 Now all those higher order activities evolve through the same pathway as the lower order systems. We can actually break this down into three phases - chaotic, transitional and linear - based upon the characteristics the activity has. 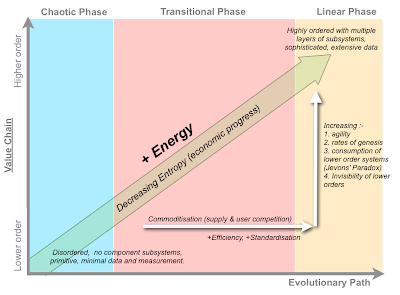 For example, in the chaotic phase an activity will be uncertain but a potential source of future worth whereas in the linear phase the same activity will be more standardised and a cost of doing business. Hence as a once valuable activity becomes a commodity, the margin associated with it tends to rapidly decline but at the same time it enables rapid formation of higher order systems which have potentially high future worth. Hence, it is the destruction of value in the old that enables the creation of value in the new higher orders. This is known as creative destruction by Joseph Schumpeter. The consequence of this, is that the process of evolution continually drives up the value chain to higher order systems. So far, I've talked about the evolution of activities but there's more to life than what we do (the activity), there's also how we do it (the practice). Practice and activity often co-evolve together. 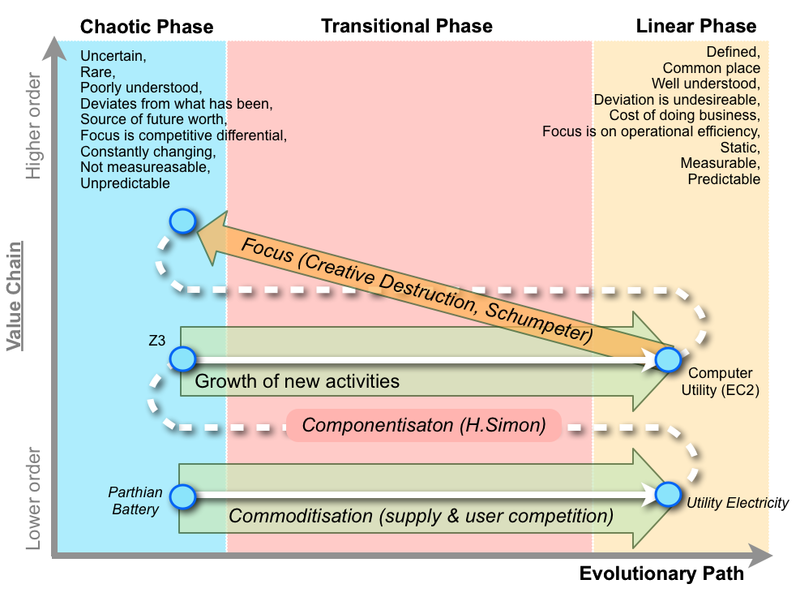 Activities undergo a transformation from chaotic to linear involving stages such as genesis, custom built, product and commodity. Practices also undergo a transformation from chaotic to linear involving stages such as novel, emerging, good and best (the Cynefin framework). The link between practice and activity is fairly simple and I'll use computing infrastructure to demonstrate. When computing infrastructure was provided as mainly products then novel architectural practices developed for scaling and resilience which became the best practice for a product world. These included concepts such a scale-up, N+1 and disaster recovery tests. 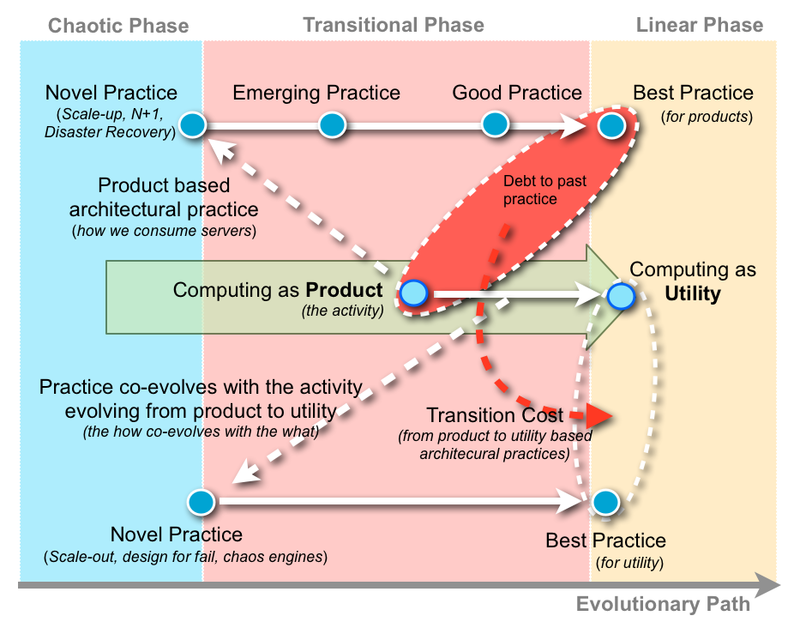 As computing infrastructure evolved to more a utility then novel architectural practices developed for scaling and resilience which are spreading and becoming the future best practice for this utility world. These include scale-out, design for failure and chaos engines (i.e. constant introduction of failure to ensure resilience). 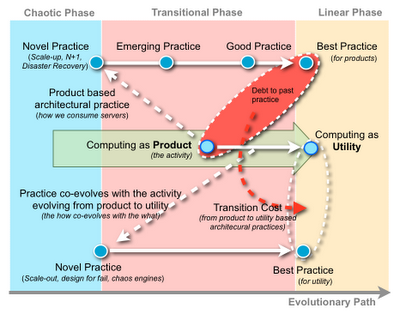 In other words, best practice for the product world is not the same as best practice for a utility world. Unfortunately this also creates a problem. As we build with certain types of practice we also incur a debt to that practice. For example, in the computing world when we built applications based upon architectural practices such as scale-up and N+1, the applications that resulted depended upon these architectural practices i.e. applications assumed the underlying infrastructure was resilient and could scale. In a more utility world where highly resilient and specialised infrastructure is replaced with massive amounts of good enough components, the architectural assumptions of our legacy applications no longer holds. Hence along with a debt to past practice we have a cost of transition to the new architectural forms. This cost of transition is one of many types of inertia to change and inertia is a critical controlling point in evolution. Inertia breaks down into two principle forms - customer inertia to adopting a change (usually referred to as Risk) and vendor inertia to providing the more evolved form of the activity. To explain this, I'm going to use a simplified version of value chain evolution and simply represent the change as a cycle of commoditisation enabling the genesis of new activities through componentisation. 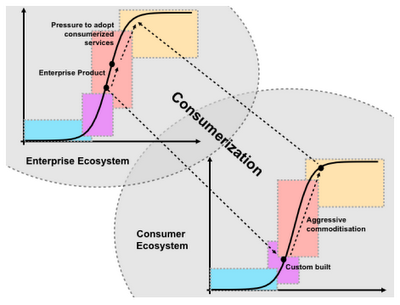 For this reason in the graph above, the value chain axis has disappeared. agency risks e.g. pricing competition, loss of strategic control, lock-in. Cultural e.g. past business models have become institutionalised, disbelief that the past the is not the future. External e.g. financial markets and analysts expecting continuation of the past. Inertia can create quite a significant barrier to change, which is often why it is a company that is not encumbered by an existing business model that creates the change and produces the more evolved form of the activity. Hence it was Amazon, a retail company with no hosting business, that introduced computer utilities through EC2. Due to competition, the more companies adopt and consume the new services then the more that pressure builds on others to adopt. What starts as a trickle rapidly becomes a flood. This effect is known as the Red Queen Hypothesis and it is why all companies must continue to evolve in order to simply stand still relative to one another. Inertia therefore acts as a gate to this flood and once broken, rapid change is inevitable. A by-product of this gate is that it creates three eras of economic change - build, peace and war. The peace era, a time of products and product services, is one where competition between providers can be considered relative. One day Nikon is in first position, the next day its Canon etc. This is a time where sustaining change tends to exceed disruptive change and the likelihood of a major player being wiped out tends to remain low (unless you're either unlucky or highly incompetent). It's also a time of the highest margin, of increasing maturity of activities and practice and where feature differentiation is critical for competition. In this peaceful era, inertia to change is beneficial as it maintains the state between the providers. Alas, as the activity becomes more widespread and defined then it becomes suitable for the next evolved state - a time of commodity and utility. All it takes is one player, not normally in that space, to kick of the war. The introduction of more commodity approaches to providing the activity initiates a fight for survival. The incumbents are normally stuck behind inertia barriers and are hence in denial that their world might change (cultural inertia). Businesses start first to lightly consume the new service due to their own inertia (customer risks) but due to the Red Queen effect, a trickle becomes a flood. As margins reduce in this space and the focus becomes increasingly on operational efficiency, the incumbent providers often respond by trying to cost cut rather than trying to adapt - this is almost always fatal. Hence in the war era, disruption (both direct and indirect) tends to exceed sustaining change and many once proud names fail. Along with the war, a build era occurs for the development of new higher order systems based upon the ubiquitous and well defined supply of a commodity. These higher orders are where capital flees to chase the new opportunities as the past is commoditised and future industries are created (see creative destruction). This is often a time of wonderment and amazement with new technological marvels. These eras of build, peace and war can be localised to a specific industry or in certain circumstances be seen at the macro level in what are known as K-waves which are more commonly referred to as ages (e.g. the age of steel, electricity and heavy engineering). One thing that is worth noting is the evolution of activity often involves co-evolution of practice and hence the formation of new forms of organisation. Hence in the age of electricity, new organisational forms appeared that exploited new practices resulting in what was called Fordism. In the internet age we had the Web 2.0. Today, cloud computing (which is all about commoditisation of discrete IT activities) is creating a next generation of organisation. Finally, it is worth noting that each build era is often associated with rapid increases in un-modeled data and corresponding debates over how to manage this. The origin of this increase in data is a combination of commoditisation of past activities and creation of new activities. The modern example of this is known as Big Data. Currently within information technology rich industries, we're undergoing one of those shift from peace to war and the formation of new organisations that exploit these practices. I provide this in much more detail on the LEF website covering areas such as new practices, use of open source as a competitive world, focus on disruption etc. However, I thought as an aside I'd mention one of the changes that is occurring which relates to the use and exploitation of ecosystems. 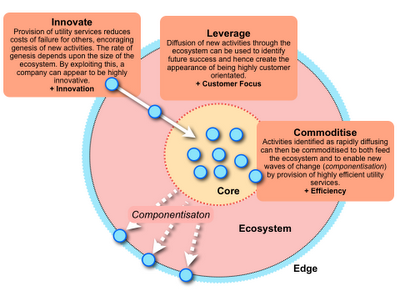 The principal model behind this is known as ILC - innovate, leverage and commoditise. Under ILC, a company seeks to provide activities that it currently produces (or more likely consumes) as utility services provided through APIs in order for others to consume them. The focus is on developing a wide ecosystem of other customers. Since, the activity is provided as a utility service then it enables others to reduce their cost of failure with any novel pursuit. This encourages genesis of new activities. However, as those new activities diffuse, the provider of the utility services can detect this and leverage the ecosystem to identify early successes. By copying or acquiring such activities and commoditising to utility services then the provider can feed the ecosystem by enabling further genesis through componentisation effects. The net result is the provider appears to be both highly innovative (by enabling others to create new activities), highly customer focused (by leveraging an ecosystem to identify future requirements) and is inherently efficient (through provision of utility). This triple whammy is counter to Porter's assertion that you can only do one of these things. It's what makes companies like Amazon so dangerous to their competitors. Critical in all of this is the size of the ecosystem, the speed of feedback and the speed of action. Hence, you can create an ILC model in a product world but it's much more effective with utility services such as those provided through APIs today. In many information technology industries, we're entering a world where it's not companies that compete but ecosystems. In the last section I referred to information technology industries because this enables me to introduce a concept known as profile. Firstly, a company consists not of one activity but many. Even if you take a single type of activity such as IT, it will consist of many discrete IT activities. These activities are likely to be at different stages of evolution and hence not all IT is the same. Some IT will be in the chaotic phase, some will be in the more linear. 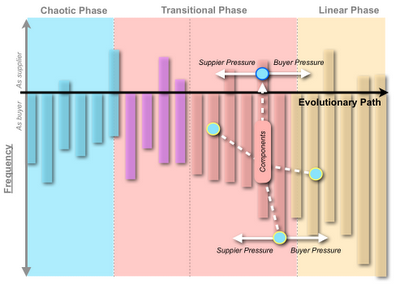 This itself creates a huge problem, because each of the phases has different characteristics. Hence, when it comes to something simple like project management - the methods you use for an activity in the chaotic phase (where deviation is necessary and the activity is uncertain) are not the same methods that you would use for that same activity when it has reached a more evolved, linear phase (where deviation is undesireable and the activity is predictable). This leads to the endless and pointless debates between methods such as Agile (or Scrum) vs Six Sigma (or Prince 2 or ITIL). The simple fact is that Agile methods are more suited to the chaotic phase whilst Six Sigma is more suited to the linear and seeing that IT consists of many activities at different phase which are all evolving then you need to use BOTH appropriately. There is no such things as the one size fits all method because the underlying characteristics of the different phase are polar opposites. This isn't just an IT thing it also applies to all other activities and hence we have other pointless debates such as push vs pull marketing (answer - you need both). Fortunately since we're all in competition, if we all apply one size fits all then no-one has an advantage. Alas, organisations have evolved beyond that point and so if you are doing this then you're already behind the game. Now, if we plot frequency of activities across the evolutionary path we get a profile for a company. It's best to subdivide activities between those you supply to others and those you consume yourself. Not only do companies have a profile but industries do as well, hence a mining industry does not have the same profile as a media company. This is also why changes impact industries differently. For example, cloud computing is likely to directly disrupt hosting companies, indirectly disrupt banking industries (through reduced barriers to entry) and it is unlikely to have a major impact (bar some efficiency gains and changes in relative position) for highly commoditised industries such as mining. In the graph above I've also added an example value chain consisting of something that is sold which is built from multiple underlying components. Now, each activity in such a chain continuously evolves (due to supplier and user competition) and is effected by Porter's five forces. For those needing a refresher, those five forces are supplier vs buyer power, new entrants, substitution and competition with others. At this point we can start stitching together many of the concepts covered in the previous graphs to discuss change. 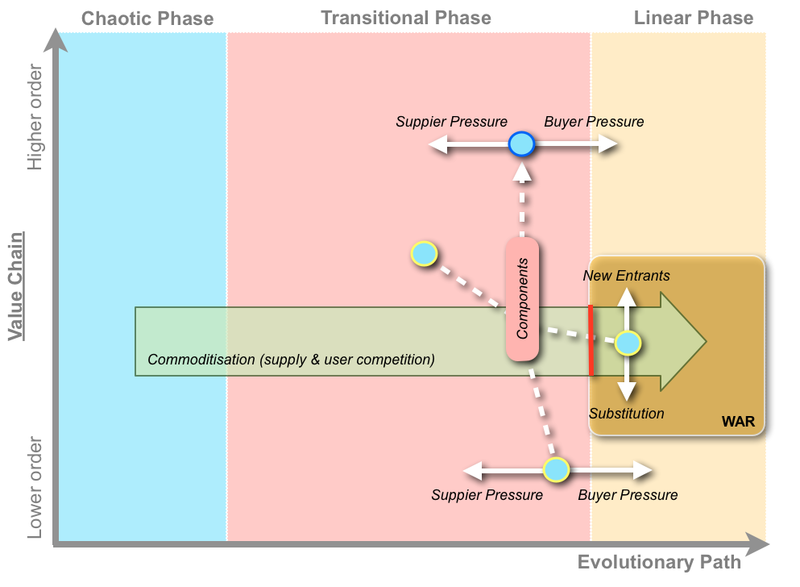 Now each activity evolves due to supply and user competition and in the above one component activity of a value chain has changed phases from transitional (custom built, product and rental products) to linear (i.e. commodity and utility service). Along with initiating the war era for that activity where new entrants, substitution and disruption of incumbent suppliers becomes more likely it can also have more subtle effects by reducing barriers to entry for competitors into the supply chain. For example, let us assume the top activity is news. The component activities might be the means of mass communication, collation and editing. If we take newsprint then the means of mass communication was previously printing combined with a distribution channel both of which are capital intensive activities. The commoditisation of the means of mass communication would not only reduce operational costs of news organisations but also potentially reduce a barrier to entry into their space. This is exactly what the internet did leading to increased competition higher up the value chain. 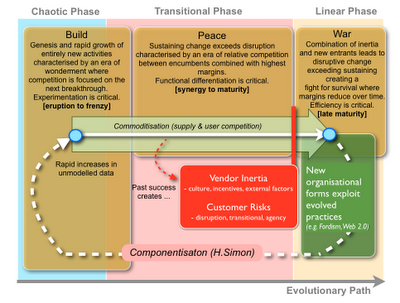 Hence, the commoditisation of an activity and the initiation of war is not only directly disruptive to past providers because of the new entrants, substitution and inertia that the past incumbents have but it can also be indirectly disruptive higher up the value chain due to reduced barriers of entry. Interestingly, as a buyer you always attempt to push component activities to more of a commodity (buyer pressure) but as the above examples shows this can actually have a negative effect by increasing competition in your main business. 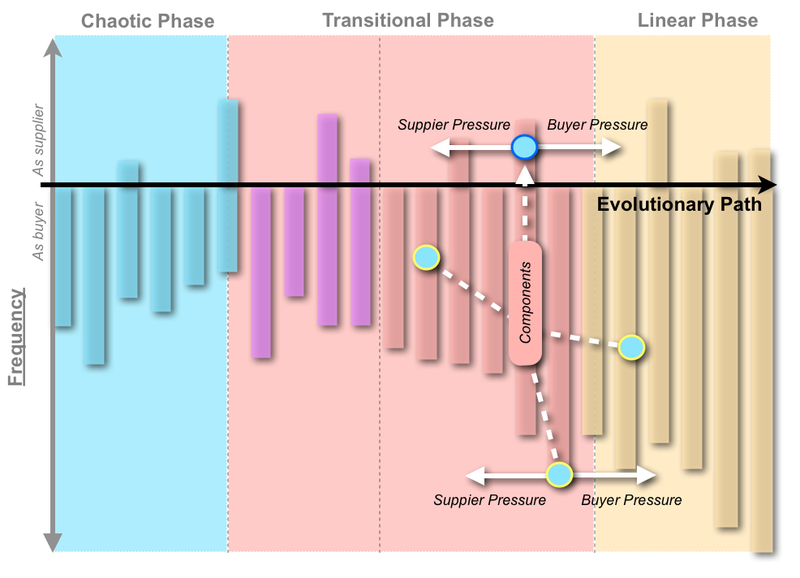 There are a host of effects you need to concern yourself with regards to strategy :- evolution, value chains, buyer vs supplier pressure, barriers to entry, choke-points, inertia, profile, positioning, ecosystems, phase, era ... it's a long, long list of things. Managing this is complex, even though the premise that this all extends from evolution driven by user and supply competition is trivially simple. Graph No. 8 - Who's running the show anyway? Previously, I talked about how commoditisation of the means of mass communication has reduced barriers to entry into the "news" organisations value chain. This caused a rapid growth of competitors, one of which is the general public consumer through blogs, twitter and other social networks. Now, a critically important point to consider when examining a strategy is who governs evolution? When I talk about evolution being driven by user vs supply competition, the obvious question to ask is which user are we talking about? Do we mean an enterprise or a general public consumer? Well, unfortunately the answer can be both and in these circumstances what matters is which group governs the process of evolution. Take for example, email. Email was being used within Enterprise organisations for communication before it became popular with the general public. At one point in time, most members of the public were first exposed to email through their workplace. Email services and products evolved in the workplace driven by the pursuit of ever more functionally complete systems with todo lists, calendars etc. However, email also spilled out into the general public where it was aggressively commoditised by providers such as AOL then Yahoo and Google. A consequence of this is that in the general public space, highly commoditised services became the norm and most people found their public email service had more capacity at a lower cost than their workplace service. Eventually this created pressure for enterprises to adopt the more consumerised form and hence Google Mail (among others) became more common in work. What happened here was that email switched from being governed by enterprise competition to being governed by consumer competition. Eventually Enterprises have to adopt these more consumerised services. This is the process of "consumerization", a term quoted by Doug Neal of LEF fame back in 2001. Given the mass of management complexity that evolution, profiles, value chains, economic eras, consumerisation, co-evolution and inertia creates - how can we ever hope to manage it? Well, we do so through structure and an interesting application of Ashby's law of Requisite Variety. Ashby's law states that in order for a system to be stable then the number of states of its control mechanism must be greater than or equal to the number of states in the system being controlled. Now there are two ways to solve this problem. Either you accept the complexity and variability of the management issues at hand and build a control system (i.e. the executive team) who are capable of dealing with it or you find someway of simplifying the complexity of what is being managed. Hence our tendency towards KPIs and traditional organisational structures. Now simplifying the complexity doesn't mean effective or efficient management, it means simply making it more manageable. Fortunately we're all in competition, so as long as we all sacrifice efficiency and effectiveness for simplicity of management then no-one gains an advantage. Alas, as we saw earlier organisations evolve and one of the noticeable patterns of the latest next generation organisation is their increasing ability to cope with change and the flow of activities from chaotic to linear. 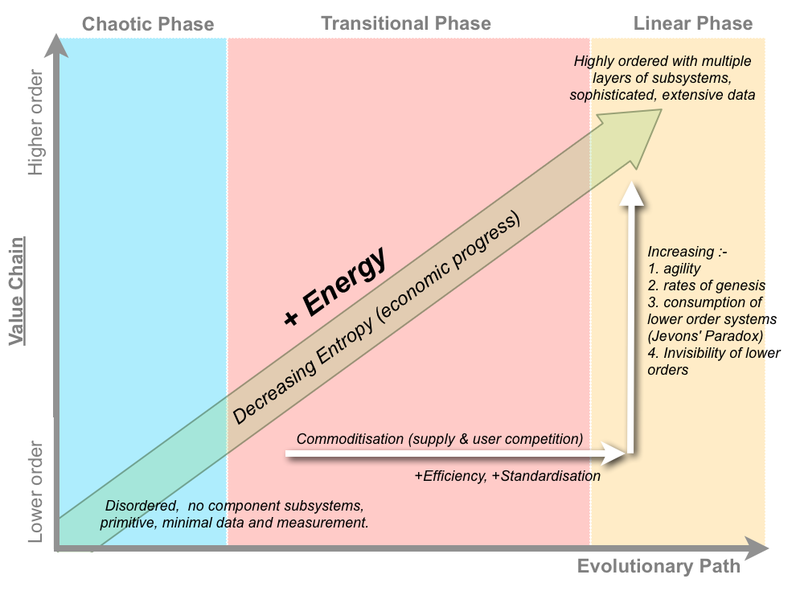 I highlighted flow because whilst linear activities can be outsourced to utility providers and the genesis of chaotic activities can be achieved through exploiting ecosystems, what is increasingly critical to business sustainability of an organisation is how it manages the transition from chaotic (genesis) to linear (commodity). Unfortunately our organisational structures aren't based upon concepts such as flow or even mindful of the constant process of evolution. We instead tend to organise by type (e.g. IT, finance, marketing). Organising by type creates a host of problems such as alignment issues, one size fits mentality and ineffective outsourcing to name just a few. There are fortunately more effective organisational structures such as the more cell like structures of the two pizza method used by many of the next generation companies. But two pizza, use of ecosystem isn't the end of the organisation story. A prototype of a pioneers, settlers and town planners structure demonstrated quite remarkable effects. In all cases, there are far better ways of managing flow than use of KPIs and traditional organisational structures and we're far from understanding an ideal structure. ... and so to my final graph. 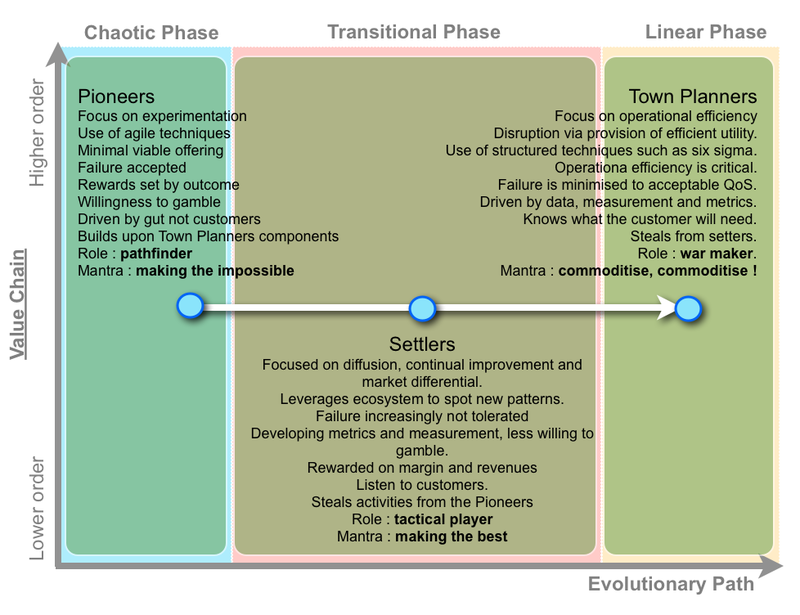 For this I'll return to value chain vs evolution path and overlay what I think are vastly more interesting than the meandering progress of activities - the end consequences. The constant snake like progress of our economy through those k-wave ages of the industrial age, the age of steam, the age of electricity each with its own build, peace and war era is driving us further up the value chain with higher order systems continuously evolving from chaotic to linear. We are continuously moving away from a disordered, primitive and information poor position to a highly ordered, sophisticated and information rich position. Now ignoring the fact that we waste energy, the shift to a more highly ordered position always requires more energy than the previous position. It also has some other consequences. Firstly, as lower order systems become more efficient we also tend to consume vastly more of them in the pursuit of the higher order capabilities (Jevons' paradox). For example, computing resources are a million fold more economically efficient than 20 years ago but this doesn't mean we spend less on IT, instead we just do vastly more higher order stuff with it and hence we consume more. Secondly, as we move to a higher position the lower order systems become less visible and consequentially we become vastly more dependent. The solar storm of 1859 known as the Carrington event had fairly minimal impacts on the society of its day. A similar storm today would impact many of those invisible, taken for granted, lower order subsystems that our society relies upon for its supply chains, production and computing. It would have a far greater impact. The above is just a tiny glimpse into the world of organisational warfare and how companies compete. Whilst no cats were harmed in the making of my presentations or blog post, tens of thousands of data point have been chomped through. Some of the graphs are complex, which is also why I use a highly visual build up in presentations. The subject matter is built from simple rules but creates a complex environment. I will however look at finding simpler ways of representing the concepts. The hypothesis above is pretty old and has become widespread enough that it is of limited value. Given this, I will probably now finish the book I've been meaning to do ... but then again. > The consequence of this, is that the process of evolution continually drives up the value chain to higher order systems. Don't want to sound like nit-picking, but what about an example from one of Clayton Christensen's books: hard drives as such are a commodity (and command very low margins), but their components (heads and plates) are not, and thus attract high margins? It appears to me that in this case, value has migrated down, to the lower order, rather than up (to computer systems, for example). I feel that his theory that the value migrates *within* a chain, rather than "always up", makes a better sense. Take, for example, your other favourite tech - 3D printing. When it hits maturity, the value will not only migrate to those who create the models, but also to those who create and manufacture the printers themselves (or their key components). And even compute infrastructure exhibits the same, with the biggest supplier of CPUs for all these COTS computers powering cloud services earning a healthy 24%+ profit. I agree that componentisation and commoditisation enable higher order value things; however I am not convinced that they completely deprive the components themselves of their value. You're not nit-picking but raising a perfectly valid point. I decided to cut away some stuff in this post maybe I shouldn't have. 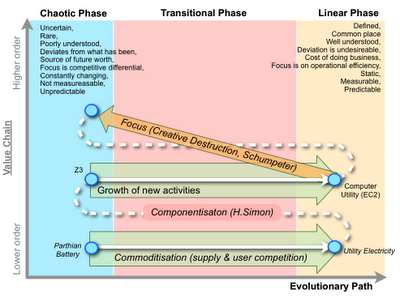 Whilst evolution continually drives up the value chain there does exist natural constraints and choke points. For example, our higher order systems maybe built upon components which can be controlled by a limited group of providers. Mechanisms of such control include access to resource, use of patents, highly capital intensive processes and even data aggregation effects. In such circumstances the supplier pressure means that the actual value created at these lower orders will be much higher than if market competition was perfect and free from constraint. Creating choke points is for example a perfectly valid strategy for increasing value and building barriers to entry into higher orders of the value chain. However, whilst I mentioned these in the post I didn't elaborate. I have another graph which explains this ... I just wanted to keep it down to ten. After reading your reply, a thought struck - does this mean that say Intel's x86 CPUs are *not* a commodity, and are unlikely to become one in near future? I mean, while they are widely available, there's essentially no direct alternative, at least not such that could be simply used in the same system. And does this therefore mean that some things are immune from being disrupted and commoditised, at least for very long periods? Are they then "stuck" on the "product" part of the curve? While normally I'd let Simon comment on this (I am _very_ wary of trying to put words his mouth) I'd like to bring your attention to the very books you quote. In Christensen's own "Seeing what's next" he addressed this very topic -- value chain in semiconductors (Chapter 7). There he details the value chain of the process, how value is created at each stage and how modularization / componentisation works in that space.